Psychic Detectives Are they for real? A look at three of the nation's top psychics and the lawmen they worked with. ~ Bob Lee - Law Officer Volume 4 Issue 8, 2008 Aug 1. Noreen Renier will appear on "Kaiki-Gensho SP", a 1.5 hour TV show aired exclusively for the Japan market that is broadcasted in Tokyo, Japan. The show will feature psychic investigator Noreen Renier assisting in providing information regarding a "missing person's" case. 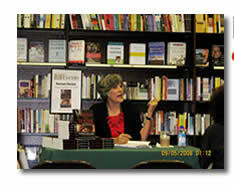 A huge crowd attended a recent book signing at Barnes and Noble to meet the author of A MIND FOR MURDER. The book features the only psychic ever to lecture at the FBI Academy, Noreen Renier has assisted law-enforcement officials all over the world, working on more than 600 criminal cases. From the discovery and development of her unique talents to becoming a respected figure in the police community, this is the true account of Noreen Renier's remarkable life and career. Visit us on the web at NoreenRenier.com. To Unsubscribe Click Here.